The Joker, by Greg Capullo. Death of the Family is one of the best Batman stories of all time. That’s a tall order, but it’s true. Scott Synder and Greg Capullo’s multi-part epic has cemented itself in the upper echelon of Batman’s best – right there up there with Year One and A Killing Joke. Here’s a look at why. Obvious spoilers ahead. There’s no question that this storyline belongs to the Joker. As much as it’s Batman’s name on the front of the book, the clown steals the show. Like all the best iterations of the character, Snyder’s Joker has a distinct voice, personality and collection of mannerisms. While some are content to write him as an eccentric prankster, Snyder’s Joker is a terrifying psychopath. He’s verbose, he’s whimsical, and he’s really, really frightening. There’s something about a mass murderer sulking in the dark, killing cops while telling Jim Gordon he wishes he could wrap his arms around him from his usual hiding spot under his bed at night while the commissioner sleeps. And while it’s often been hinted at – Snyder comes right out and says it: the Joker is in love with Batman. He pushes for the death and humiliation of Batman’s allies with all the intensity of a jilted lover, and the book all the more unsettling for it. It’s not a romantic love, and it’s not love in any traditional sense of the word – but there is something that burns deep in the Joker for Batman. He’s the reason he gets up at night, and the last thing he thinks about before going to sleep. This is a Joker that stays with you long after you close the book. The way he’s written transcends “super-villany” and heads into genuine horror. Which leads me to my next point: this is a horror comic. It starts with a deranged, mutilated nutcase who goes on a massive killing spree and ends in an asylum where bodies have been stitched together in the name of “art” and helpless innocents are being tortured. This is not Adam West and Burt Ward – this is pure, unadulterated horror. And it works. 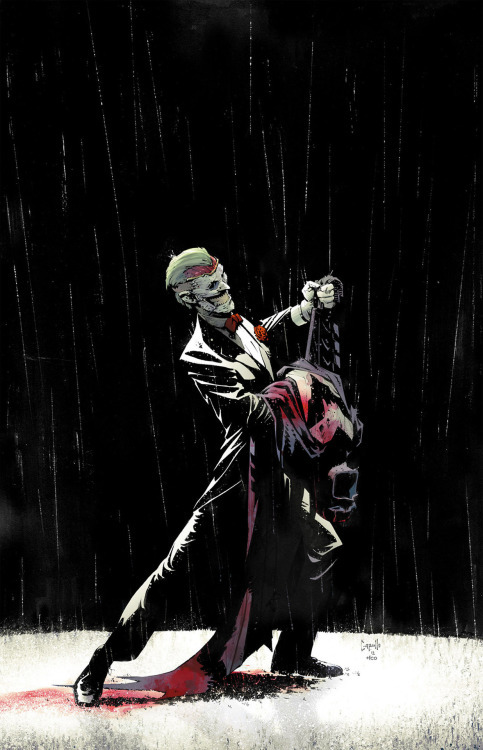 Batman and the Joker work better without the constraints of the Comics Code (RIP) holding them back. Snyder’s characterization, dialogue and pacing are all dead on. All the characters read as people – not comic book stereotypes trying to be people. Greg Capullo mastered bleak, dark, hyper-detailed art on Spawn, and he’s even better on Batman. His version of Gotham is vibrant and alive, and characters pop right off the page. But Capullo’s greatest triumph lies with the Joker. Didn’t think his requisite grin was creepy enough? You’re in luck – because they cut his damn face off, reattached it with a belt and some zip-ties and let it rot on his head as the story progresses. It gets punched off his skull and he wears it upside down. His FACE. It’s the stuff nightmares are made of, and adds to the distinctive flair this version of the Joker has. There’s been some whingeing online that “nothing happens” at the climax of this storyline – but Capullo’s restraint is a triumph for the medium. Comics have played fast and loose with the concept of death for years – so much so that it really doesn’t matter anymore. From Captain America to the Human Torch and Batman himself – when a character dies, the immediate reaction from readers is usually something akin to “he’ll be back.” It’s a hackneyed, overused plot device with no weight. In the same way, it would’ve been easy to kill off Alfred or Damian – but Snyder chose an introspective, muted approach, choosing to cripple Batman’s inner circle and not bludgeon one specific character. That’s the kind of scar that bubbles under the surface longer than a superficial death. It rattles the status quo without the expectation that everything will be back to normal in six months. It hurts in a real, personal way that anyone can relate to. We’ve all been hurt, and we’ve all been betrayed by someone we thought we knew and trusted. It’s real – and that’s what makes this payoff so satisfying. For us, and for the Joker. Think about A Killing Joke, which is considered a masterpiece. Sure, Barbara Gordon gets shot, ending her career as Batgirl and forcing her into a wheelchair – a place she stayed for years. And while that darkness and horror can be consuming, it’s not how Alan Moore ends the story. It’s that personal moment, that one beat at the end when Batman and the Joker share a laugh – that’s what stays with you. It’s honest interaction, and something that gives weight to the characters. That’s exactly what Snyder has managed with Death of the Family. And that’s no small feat.